In the quest to build an artificial cell, there are two approaches: The first, reengineers the genomic software of a living cell. The second, focuses on cellular hardware, building simple, cell-like structures from the ground up that mimic the function of living cells. One of the biggest challenges in this second approach is mimicking the intricate chemical and biological reactions required for cells to perform complex behaviors. Now, an international team of researchers from Harvard University and Sogang University in Seoul have engineered a cell-like structure that harnesses photosynthesis to perform metabolic reactions, including energy harvesting, carbon fixation and cytoskeleton formation. "This research, part of a rich collaboration between Harvard and Sogang University, opens up several different fronts on what could be done at the cellular level," said Kit Parker, the Tarr Family Professor of Bioengineering and Applied Physics at the Harvard John A. Paulson School of Engineering and Applied Sciences (SEAS) and co-principle investigator of the project. "We have activated metabolic activity with light, built an on-demand protein network in a living cell and packaged all of the components required to do this into one cell." Parker is also a Core Faculty member of the Harvard Wyss Institute for Biologically Inspired Engineering and the Harvard Stem Cell Institute. "The mechanisms we have demonstrated should be the first step in the development of multiple regulatory networks for artificial cells that can exhibit homeostasis and complex cellular behaviors," said Kwanwoo Shin, Director of the Institute of Biological Interfaces and Professor in the Chemistry Department at Sogang University, and co-principle investigator of the project. 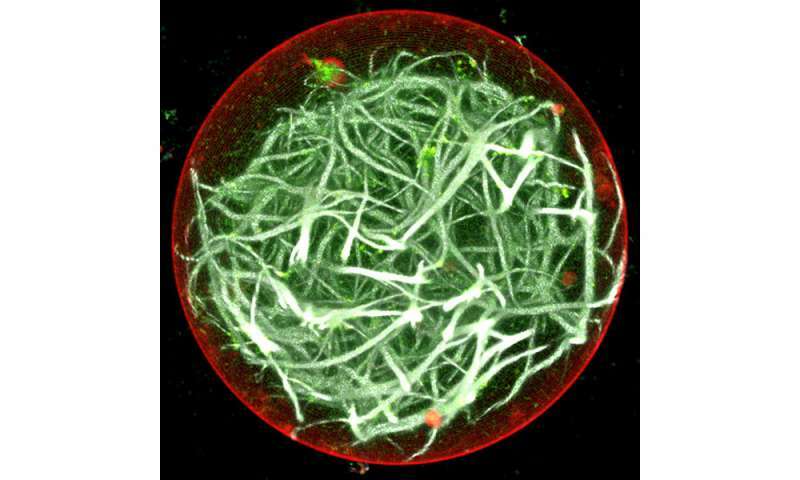 To build this synthetic system, the researchers engineered a photosynthetic organelle from the unique components of the plant and animal world. "Our idea was simple," said Keel Yong Lee, a postdoctoral fellow at SEAS and first author of the research. "We chose two protein photoconverters—one from plants, the other from bacteria—which can generate a gradient across the cellular membrane to trigger reactions." The photoconverters are sensitive to different wavelength of light: one red, the other green. The proteins were embedded in a simple lipid membrane, along with enzymes that generate adenosine triphosphate (ATP), the essential energy carries of cells. When the membrane is illuminated with red light, a photosynthetic chemical reaction occurs, producing ATP. When the membrane is illuminated with green light, the production stops. The ability to turn energy production on and off allows the researchers to control many reactions within the cell, including the polymerization of actin, the quintessential building blocks of cells and tissues. "Previous research in the field used these proteins to generate ATP, but only ever one at a time," said Sung-Jin Park, a research associate at SEAS and Wyss and co-author of the paper. "We have combined the best of the plant world with the best of the animal world, allowing us to tune and regulate the energy production of the cell. We are engineering these cells from the bottom up, starting with these individual proteins." Being able to control and tune the production of actin allows researchers to control the shape of cell membranes and may provide a way to engineer mobile cells. This bottom-up approach could be used to build other artificial organelles, such as endoplasmic reticulum or a nucleus-like system and could be the first step towards artificial cell-like systems that can mimic the complex behaviors of biological cells. "Introducing networks of functional proteins and organelles into an artificial cellular environment will pave the way to achieving the great goal of building a cell de novo," said Shin. "From fertility medicine, to trauma wounds, and on to other, more exotic diseases, we now have a basic understanding of the tools and requirements to control what happens in a cell. The idea of cellular prosthetics is getting closer and closer with this result,"said Parker. Good one. Harvard Univ. Engineers a Cell-like Structure That can harness All 3 Metabolic Reactions To Perform Photosynthesis 1) Energy harvesting 2) Carbon fixation and 3) Cytoskeleton Formation ! Idea of Cellular Prosthetics is getting Closer and Closer with this result," said Prof. Parker !